Tremor is low, and CO2 emissions have decreased a bit over the past weeks. The apparent low activity may be the "calm before the storm": a surge in CO2 gas emissions since the beginning of November indicates that fresh magma might be on the rise within the conduit (CO2 being the least soluble magmatic gas and the first to leave the new magma). One possibility is that the arrival of new magma leads to a strong initial (and very dangerous) explosion. This scenario occurred in 2003 and 2007 during similar stages of activity (after the end of a sustained lava flow). INGV Catania reports strong degassing and that ash emissions from the summit vents have decreased. When observed last evening, the most advanced flow fronts were at 500-550 m elevation. Near-constant glowing rockfalls detach from the lava flows, sometimes reaching the lower parts of the Sciara. The lava continues to flow through the northern channel on the upper Sciara del Fuoco. Effusion rate remains significant. Small ash emissions continue to occur from the western summit vents. Yesterday's lava overflow has established a new channel for the ongoing lava flow now along the upper northern part of Sciara del Fuoco, closer to the escarpment and more visible from the 400 m webcam. The previously active flow in the central part of the Sciara is now inactive. A short-lived overflow of lava to the northern part of the flat area at approx. 600 m occurred this morning. Heat radiation from the volcano as measured by satellite has been showing a slowly decreasing trend since 22 August, suggesting that the magma discharge rater has been overall declining. The lava flow follows the path on the central part of the Sciara and its front reaches 50-100 m above the sea shore. The summit area remains closed for excursions due to the increased risk of a larger landslide and/or a strong sudden explosive eruption. Visitors are allowed to climb to 290 meters only. The main flow front almost reached the sea again last night and this morning, but stopped shortly before the shoreline. Beneath the vent at 650 m elevation, occasional overflows occur to feed small secondary flows on the northern upper part. This was visible on the publicly available INGV webcam located at 400 m elevation. Whether this is already the end of the effusive eruption that started a month ago (7 Aug) and a return to "normal" activity, i.e. 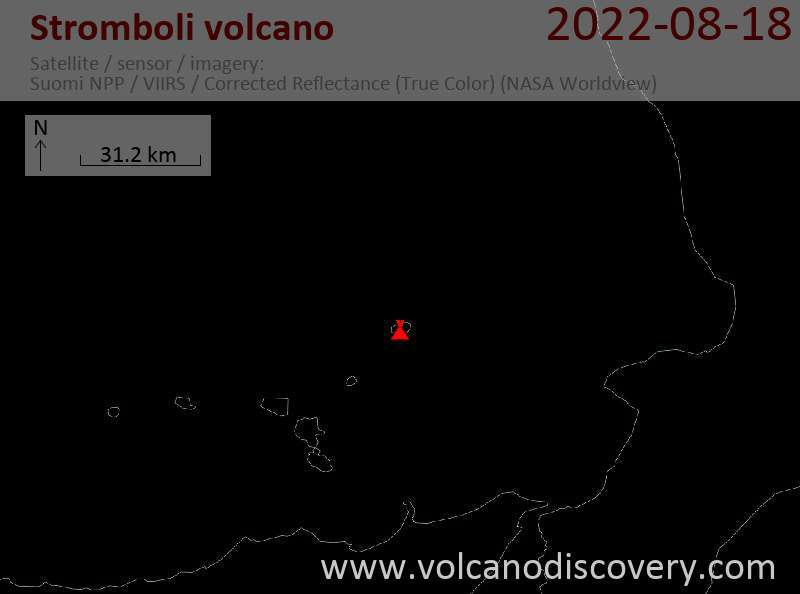 intermittent strombolian explosions at the summit vents, is too early to say. No significant changes have occurred. The lava flow(s) erupted from the vent at 650 m elevation on the northern base of the crater continue to be active on the upper part of the Sciara del Fuoco only. Compared to previous days, the flow has been weaker today. Weak explosions sometimes occur from the summit vents. The lava flow in the new channel at the eastern side of the Sciara del Fuoco remains well alimented. After a calmer weak, it is now again reaching the sea, at least intermittently. View onto the upper part of the lava flow early on the 10th of August, showing the trajectory of the lava from the vent down onto and across the plateau before it flows down the Sciara del Fuoco. Only the vent at the origin and the overflow from the plateau are visible from the 400 m webcams. Whilst on the afternoon of the 23rd of August lava was still flowing down from the plateau in much the same location as it had done since opening of the vent on the 7th of August, the overflow of lava from the ca 600 m plateau onto the Sciara del Fuoco had substantially decreased by the early hours of the 24th of August. Decreasing effusion rate this afternoon lets the channels almost "fall dry"
Lava flow activity continues. However, the recent surge in lava effusion seems to have considerably lost strength compared to yesterday. The eruption continues with no significant change, but lava effusion seems to have increased. Several secondary active branches formed on the upper part of the new lava flow field and are visible on webcam images. No significant changes have occurred during the past days. The lava flow continues to be active from the vent at the base of the NE cone, but the effusion rate is slowly decreasing overall. 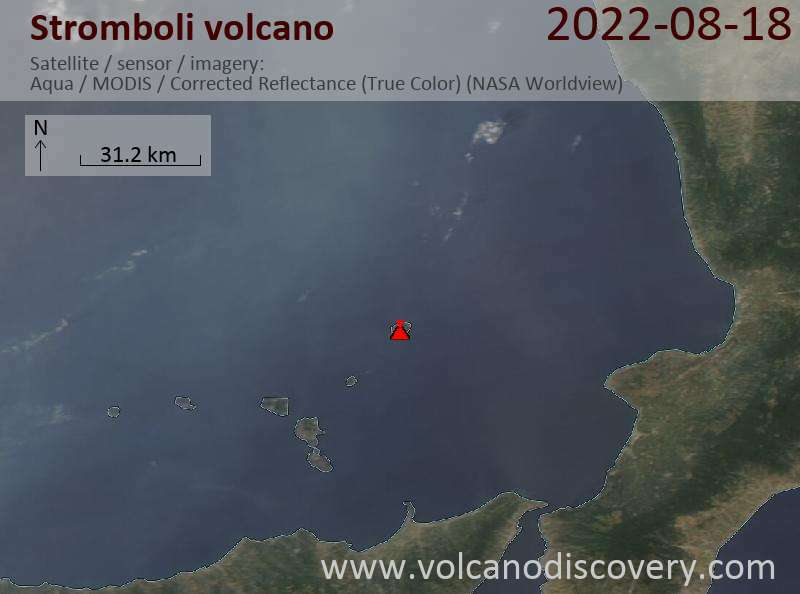 A set of videos showing the new lava flow, the sea entry and explosive interaction with the sea water is available at our Stromboli August 2014 video page. The lava flow continues to be well alimented with little variation visible. It forms an active stream on most of the Sciara, but its flow front during the past days only occasionally reached the sea, and rather accumulated to thicken the lava delta at the NE base of the Sciara. Several lava branches were still weakly active on the upper Sciara, causing many incandescent rockfalls.